Upshift contributors Tim Burke and Chris Modell both had eyes for Scotland and when rental and tour company rentamotorcycle.co.uk said they would show them the way, they jumped at the chance. It took a lot of convincing…okay fine, it didn’t take any convincing when Chris Glaspell, editor of Upshift Online, contacted me to ask if I was interested in riding motorcycles on narrow, twisty, and jaw-droppingly scenic roads. That wasn’t all he had to say though…we would be riding with an expert local guide on brand new rental motorcycles. Oh, and one more thing: he needed us to report back on the groups’ findings about the best whisky that this slice of heaven had to offer! I got a little weak in the knees with excitement! 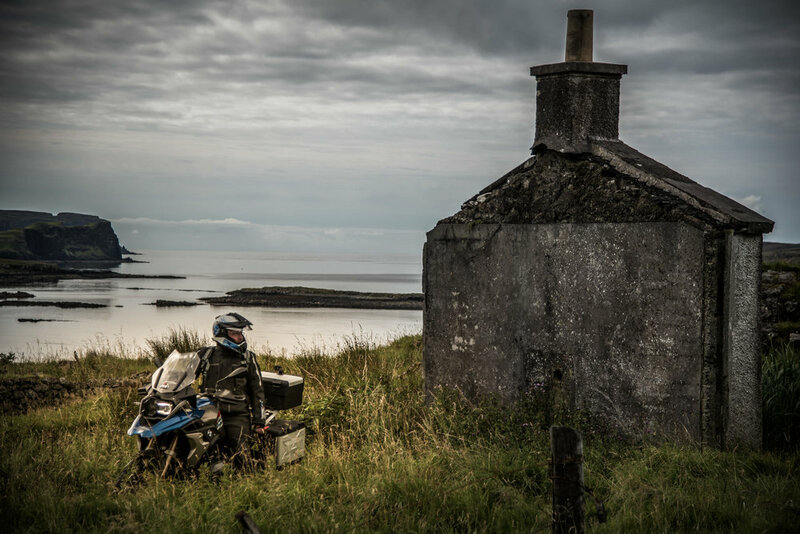 I was already 25,000 miles into my European journey when I arrived at www.rentamotorcycle.co.uk or “Rent A Motorcycle,” based at BMW Motorrad Central, in Edinburgh, Scotland. They are an independent, family-owned business that is staffed only by enthusiastic motorcyclists and adventurers. It was there that I met my teammates for this Journey, Martin Williamson and Chris Modell. 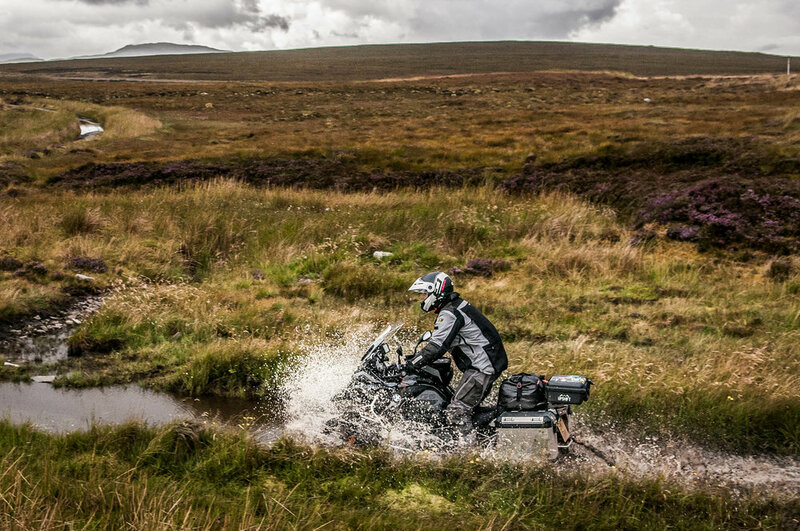 Martin, our tour guide, has been riding motorcycles in Scotland for decades. He knows every nook and cranny of the land like the back of his hand and has been guiding 2-wheeled tours in the region for about 10 years. He is the resident comedic-meteorologist for all motorcycle trips that Rent A Motorcycle organizes. Chris, first and foremost, is a family-man, who speaks often of the accomplishments of his three children and his wife Steph. An experienced adventurer and full of stories, Chris has sailed a small sailboat across the Pacific Ocean and has ridden motorcycles on multiple continents! He has a beard that commands respect and dance moves that garner the locals’ attention with ease in small Scottish pubs. Chris is a man of experienced wisdom, who in just five days of riding, taught me a lot about life. For this journey, we would be riding three motorcycles from the Rent A Motorcycle line-up. 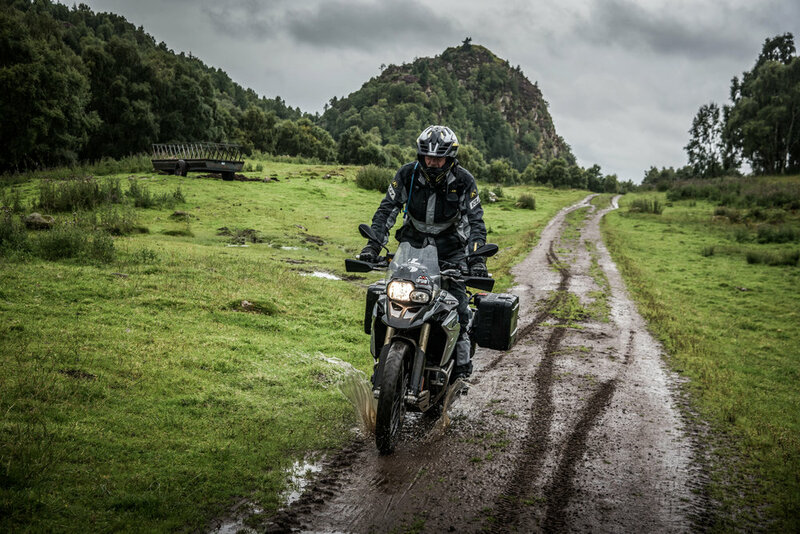 I would ride the ever so familiar R1200GS Adventure: Triple Black paint scheme and brand new! I chose this bike because I could directly mount my camera case to it. 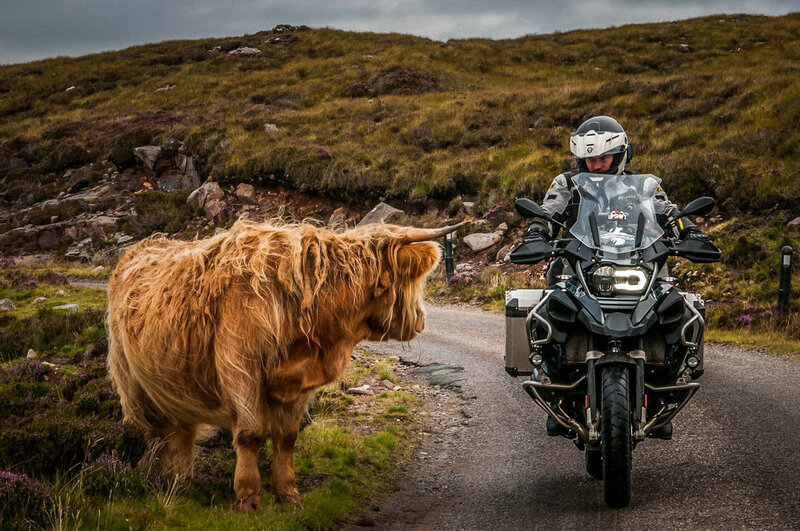 Chris would ride an F800GSA while Martin would tear up the Scottish roads on a brand new R1200GS Rallye. These are just three bikes from Rent A Motorcycle’s 25-motorcycle line up. Daily rental prices range from £95-219 and the bikes are almost always less than 6 months old. What’s cooler is that virtually every model of BMW motorcycle is available. They even offer a side car if you’re confident enough to take on the narrow roads with such a beast! The magic of Rent A Motorcycle’s business lies in the ease of making a U.K. motorcycle vacation attainable for anybody. Located just outside downtown Edinburgh, only 15 minutes from the airport, your job is to simply show up. It’s recommended that you bring your own riding gear but everything else has already been taken care of. Hotel and restaurant reservations? Not a problem. Epic routing? Already planned! Rent A Motorcycle has you covered. Just ride the bike! The dealership, where Rent A Motorcycle is based, is full of local rider-knowledge that will pre-program tracks into your GPS. 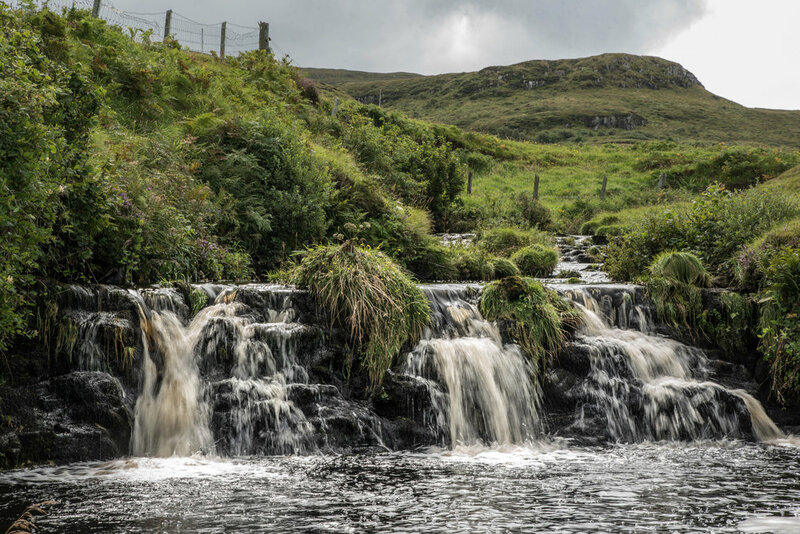 These off-the-beaten tracks are guaranteed to keep you far from tour buses, off busy motorways, and take you deep into this fairytale land. Some of the roads that we traveled, in our 5-day/1,250 mile excursion, don’t even show up on Google Maps! It was a Friday when we pulled out of the busy streets of Edinburgh, bound for the single track twisty roads of the Highlands. 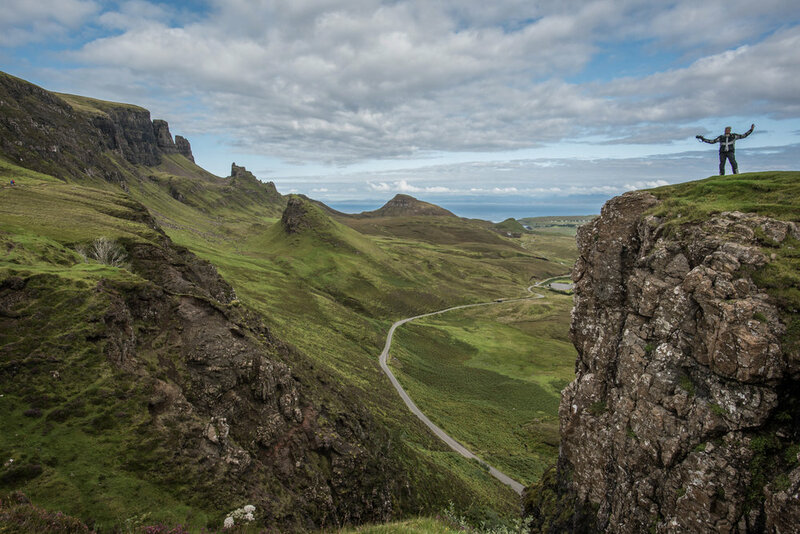 It should be noted that “single track” in Scotland refers to roads that are only wide enough for a single vehicle – not single line trails, associated with mountain biking and dirt biking. Within 15 minutes we were driving through the Scottish countryside, through forests so thick, it seemed as though we were in a tunnel. One footpeg-scraping turn after another, we came across Scotland’s oldest working whisky distillery, The Famous Grouse. Old whisky barrels line the property, really driving home the spirit of Scottish whisky culture. 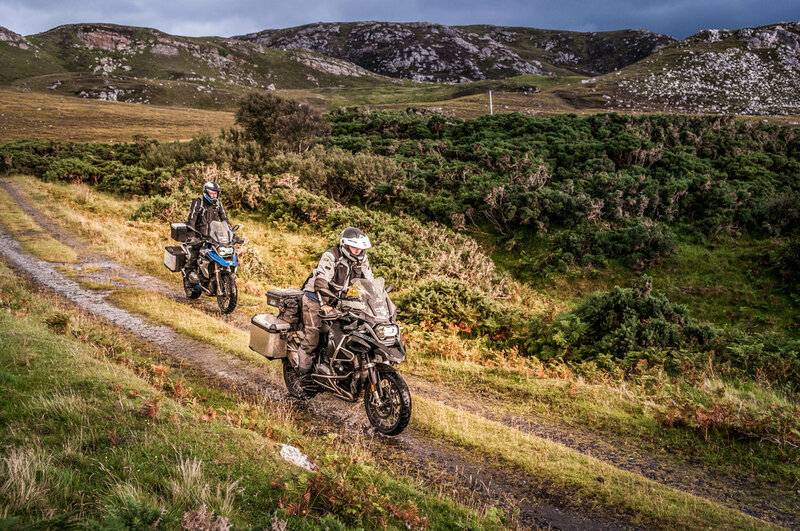 With Martin leading our charge, true adventure isn’t hard to find around the green hills of southern Scotland. 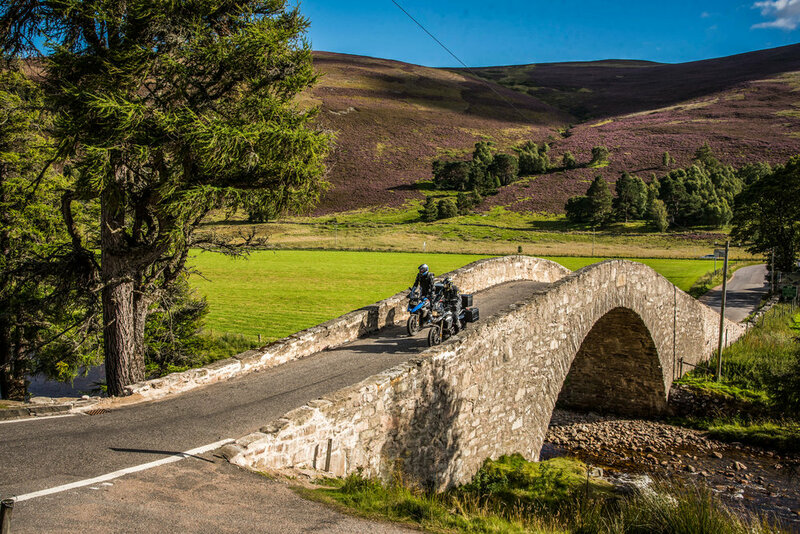 The smells of recent rain, agriculture, and the hum of BMW motors, as we twisted and climbed our way into the Cairngorms National Park, really have a way of connecting your soul to the land. No words seem right to serve justice to the magic of riding in this mystical place. Every bend in the road offers a postcard-worthy scene, and with Chris and I stopping to take so many pictures, it offered Martin the opportunity to teach us about each area that we were in. An absolute expert on each road that we were on, Martin would tell us what was lying ahead: “We’re coming up on Scotland’s Highest Mountain Pass” he’d say or he’d offer a short story about a historical event that occurred on the very spot that the motorcycles were parked! The day ended in the small village of Grantown on Spey, with what would become ritual: A celebratory tasting of Scottish whisky that Martin conveniently kept in his top pannier! Early to rise, we were on the road again, bound for the Northern Highlands. If this land is not on your bucket list yet, I suggest you put it there. Miles upon miles of paved paths, so narrow that care must be taken when passing, climb through these hills. As we approached the northern coast of Scotland, which is jagged and steep, Mother Nature put on a magic show for us! The lighting was like nothing I’ve seen before. The clouds separated right at sunset and golden rays of light illuminated the road, the motorcycles, and the land. It was so beautiful, with so many gorgeous scenes, it took us nearly an hour to cover the last 10 miles of the day! We arrived in the small village of Durness and ended the day with, you guessed it, the finest whisky a motorcycle top box has ever carried! Music at the local pub started shortly after eight, where all 10 of the village’s residents seemed to be hanging out! A father/son team pumped out song after song of traditional Scottish music on a guitar and accordion. It took a whole two minutes before Chris was dancing his way around the small restaurant! After a long late night, and seemingly, not enough rest, we hit the road towards Plockton, a small fishing village of the rugged west coast. Our first stop though, was still in Durness: The Smoo Caves – A network of ancient, natural tunnels carved out by raging underground rivers. I’ve never seen anything so gloomy and pretty in my life. Especially at the same time! These cows, massive in size, hang out on the sides of the road and have hair that would make Donald Trump’s mop look neat and well-put! The next morning, the Isle of Skye was on the horizon and both Chris and I, having heard of it before, were absolutely excited to see it. It was on this island that the team would conduct a full-fledged Search & Rescue mission for a cell phone that was left on the pannier of a motorcycle! Can you spot the phone in this picture? 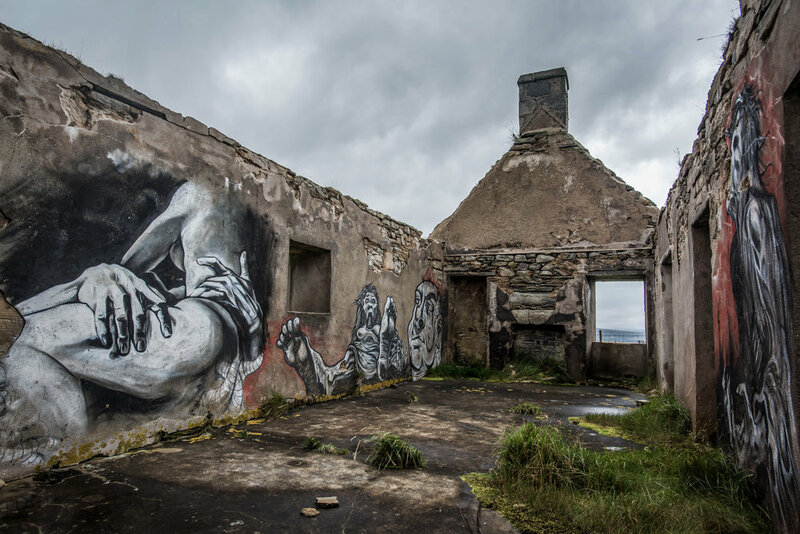 We spent time exploring the sight, sounds, and small roads of the island. Southbound we pressed, off the island via one of the most memorable boat rides of my life: The Kylerhea Ferry. 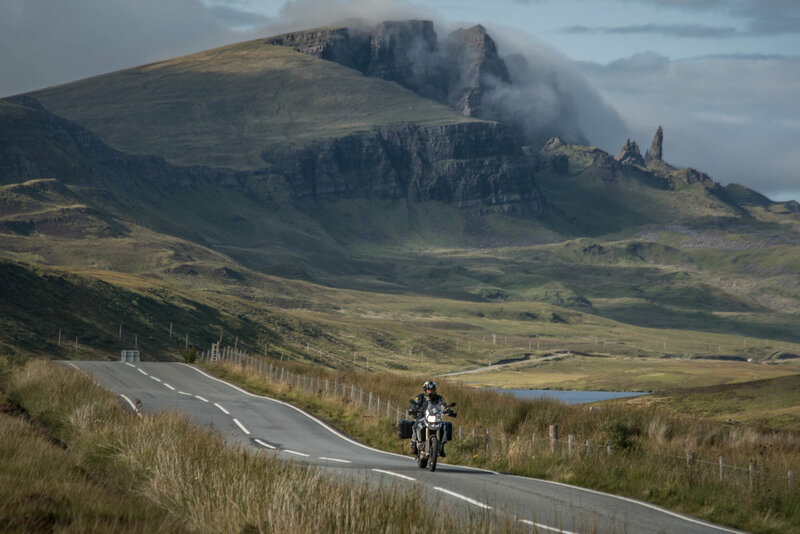 This is a true gem of the Scottish Highlands that is a must-visit when you ride with Rent A Motorcycle! Although the ferry crossing is only a mere 600 meters (2000 ft), massive tides can make the crossing look pretty gnarly! That’s not what makes this old ferry system so unique though. It’s the turn-table style vehicle deck. With this boat, you drive onto the vessel in a normal manner. Once the vehicles are loaded, the 2-man crew turns the entire vehicle deck around. It’s balanced and pivots on a center axis. I’ve never seen anything quite like it. Our last night on the road was spent in Glenelg, where again, we ended our high-mileage day with a toast and taste of delicious whisky! Our last day, from Glenelg to Edinburgh, rang in at just under 250 miles. I can’t describe in text how special the people of Scotland make you feel as a visitor in their land. “Highland hospitality” is what they call it, but it is so much more. It’s a culture of inclusiveness. A group of people who want nothing more than for others to see the beauty of their people and their country. There is no easier way to experience this than the incredible simple process of hopping on one of Rent-A-Motorcycle’s 25 bikes. 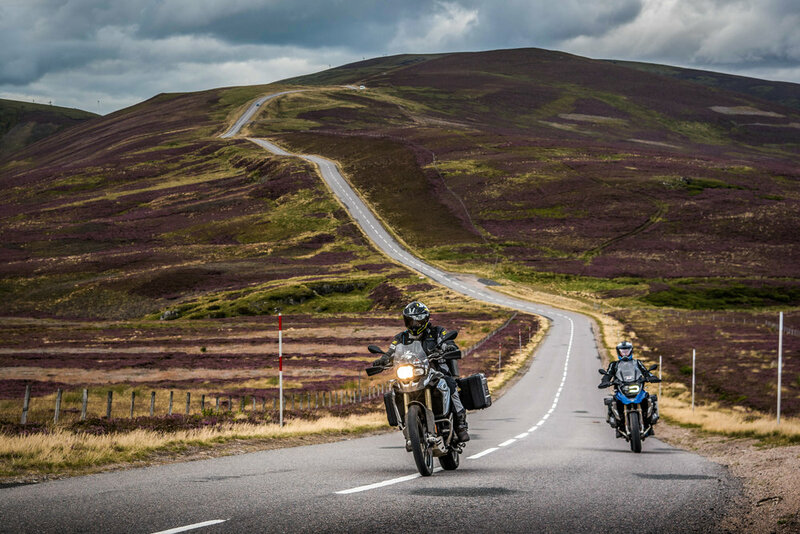 For more information on how to plan your own Scottish adventure head over to www.rentamotorcycle.co.uk or call and chat with the owner himself at +44 (0) 131 603 4466. Thank you so much, Martin, for the wisdom, experiences, and impeccable weather forecasting “It’s gonna be wet!” during our time in your amazing country.